"Mule Pendant in Sterling Silver"
Mule Pendant in Sterling Silver, great for anyone. The Gorgeous Horse, your number one source of equine jewelry. 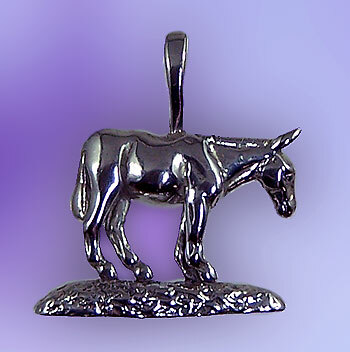 Check out this adorable mule on a little hill just like you see on your farm. A cute little piece like this is a lot of fun and could be great for the little riders in the barn. Give this pendant a good home and it will be sure to brighten up any room! Available in 14 kt yellow gold, white gold or sterling silver.